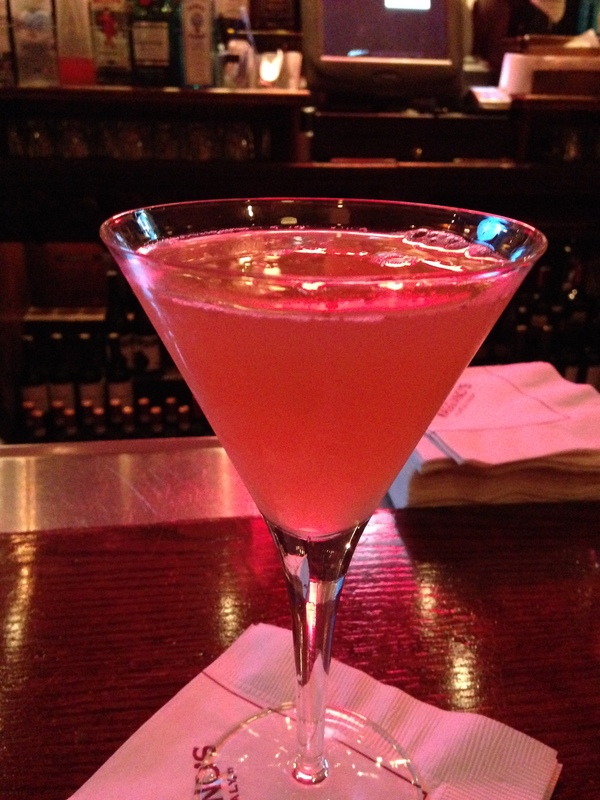 The side car I drank last night at Maggiano’s. It was actually orangey-yellow, not pink—that’s just the lighting. Considered by many to be “the only good cocktail to come out of the long national nightmare that was Prohibition,” the Sidecar is a classic post-WWI concoction with a disputed origin. Three different versions of the Side Car follow. I included the 1934 one (taken from The Merry Mixer by William Guyer) because of the bizarre “throat preparer” recipe attached to it. The modern one comes from New York’s Employees Only, a speakeasy-themed bar which recreates Prohibition cocktails for modern tastes. 1/6 gill of fresh Lemon Juice. Shake well and strain into a cocktail-glass. Toast some bread . . . crustless. On each slice place thin layers of dill pickle. Sprinkle with grated cheese, and bake in a hot oven until the cheese melts . . . or the whole business burns up. Moisten the rim of the cocktail glass with the lemon wedge. Carefully dip the rim in the sugar so that only the very top edge is coated evenly. * Place the glass in the freezer to let the sugar rim harden. Pour the cognac, Cointreau, and juice into a mixing glass. Add large cold ice cubes and shake vigorously. Strain into the prepared cocktail glass. Garnish with the orange twist. * Author’s Note: Sugaring the rim in this way was first done in the 1930s; the original drink recipes do not call for this step. This entry was posted in drink recipes and tagged 1920s cocktail recipe sidecar, 1920s cocktail recipes, Prohibition cocktail recipes, vintage cocktail recipes. Bookmark the permalink. Ah so you’ve researched them too! You should definitely do some posts on them then! What drinks ended up in your books? The FMC and one of the women in the supporting cast have their favourit drinks (the men don’t drink and they are always joked to be drys). Sinéad’s favourite corcktail is the Rob Roy. Susie’s favourite is the Daiquiri. Though the reason why I researched the cocktails was that I wanted to know what kind of stock the speakeasy would have. What produce they would buy and what kind of job the bartenders would do behind the counter.